We took the nieces to a water park for the first time ever yesterday and yes it was absolutely crazy! I brought my camera but really didn’t get any great pictures because holy cow keeping track of two little ones at a busy water park is stressful! But it was so much fun. This is what they looked liked when I explained that a water park wasn’t just a splash pad it’s that thing they always say they want to go to with all the water slides that they see on the freeway haha. 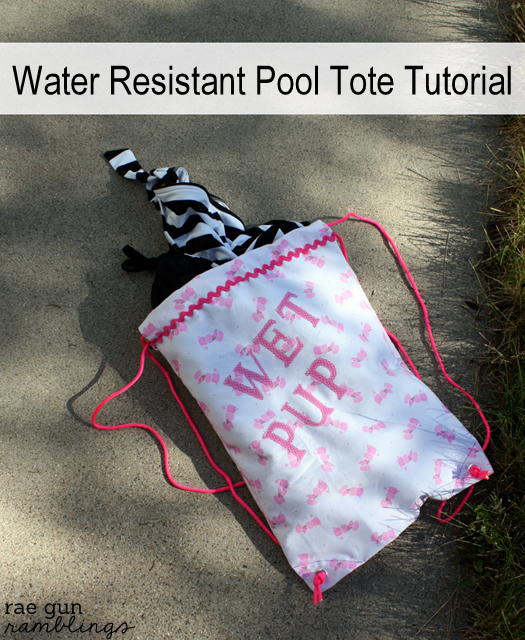 I know we’ll have a lot more water fun the rest of this summer so I decided to make us a water resistant pool tote. 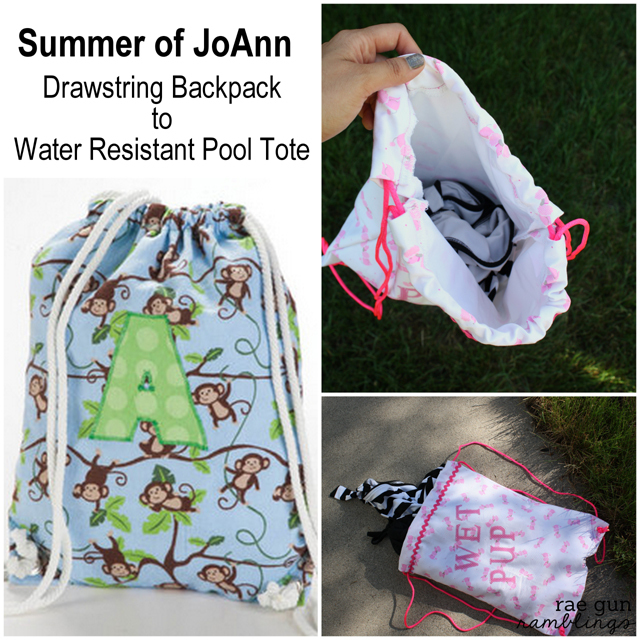 If you don’t already know, JoAnn Fabric and Crafts has a ton of free kid related projects with instructions on their website as a part of their Cape Discovery . 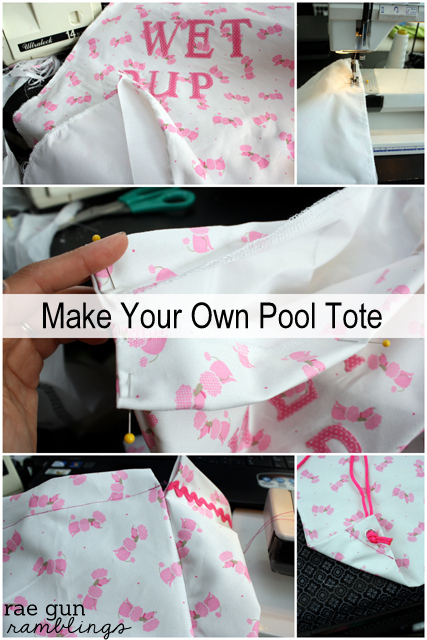 I found this awesome drawstring backpack tutorial and knew I wanted to make something that we could throw wet bathing suits in after our Summer outings. I pretty much followed the instructions but before I started sewing the side seams of the back together I sewed a piece of water resistant nylon (also found at JoAnn) to the wrong side of my bag fabric. Check out the original project here, but really quickly this is what I did. 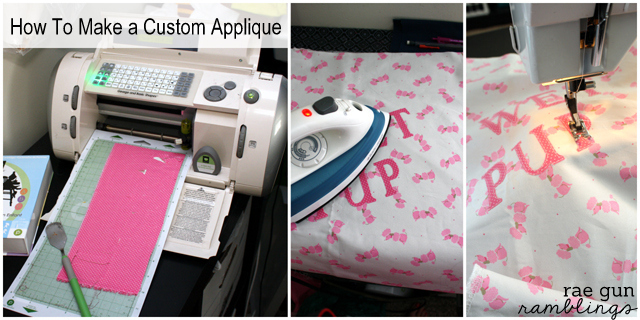 Cut bag pieces 32 inches by 12 inches (one out of outside fabric one out of lining fabric). Make Iron-on I did this with my trusty technique of heat bond and then I just ran it through my cricut cutting machine. But you can also use wonder under. Iron letters down. And top stitch. I just chose to do a straight stitch but the backpack directions give you good tips on zig zagging for a more traditional applique look. Next position the nylon on the wrong side of the bag fabric serge or zig zag around all four edges to prevent it from unraveling. Fold in half. Mark where you want the casing to be. I picked 3 inches from the top so when it’s folded it would be a 1.5 inch opening. Then sew from the fold to that mark. Right side out the bag. Tuck the finished edges of the top under fold and sew down the casing. If you want to add some rick rack like I did you can do that now. Then cut 2X 2 yard pieces of rope. Mine were meltable so I flamed the ends until they melted together so they wouldn’t unravel. 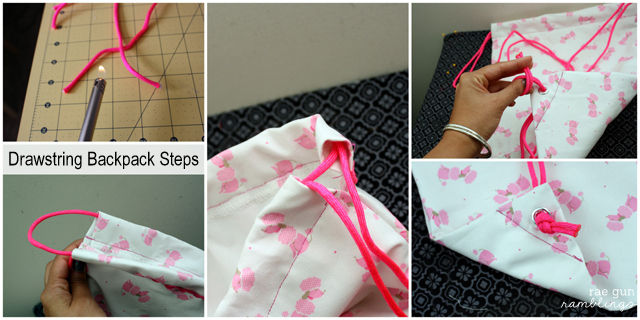 Sew a line across the bottom corners. This is where you’ll put the eyelets. 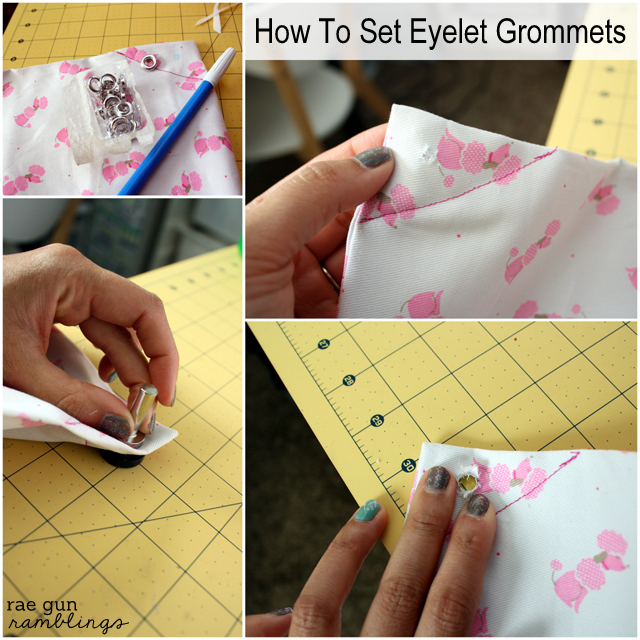 Using an eyelet set (found on the notions isle at JoAnn) follow instructions and set the eyelets. String your rope through the casings at the top of the bag so that it makes a U in both directions. Next feed them through the eyelets, knot and you’ve got a finished bag. 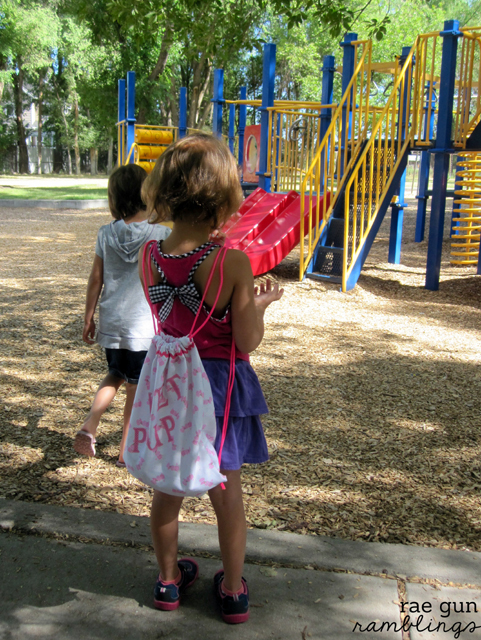 This project was so easy and the basic unlined bag would be even simpler. I just stated teaching my nieces to sew (more on that soon) and after making this I think I’m going to have them each make their own drawstring bags that they will be proud to tote around. If you’re looking for things to keep the kiddos busy this Summer make sure to check out those Cape Discovery projects and if you don’t already know JoAnn has a whole kid crafting section full of kits I may have ahem an entire box full that I have been letting the nieces pick projects from while they are with me this Summer. If you do plan on buying anything JoAnn make sure to sign up to be a preferred customer so you can get a nice 20% discount. Thanks so much to JoAnn for inviting me to be a part of their Summer of JoAnn Challenge. A gift card was provided to purchase supplies for this post but the content and excitement is 100% mine. I love this so much! The water resistant part totally sold me. Thanks for sharing! yeah I want a pool within walking distance too! that sounds great! That is so cute! Much better than the plastic grocery bag that I use. Oh my goodness this is so cute! I wish I had one. Very cute! I’m not very good on the sewing machine but I think I could do this! Adorable! Such a great idea… and I’m sure these will last through several summers! What a great tutorial. I am pining this fab project. coming over agawin to read additional news.